Ready-made (Shelf) Hong Kong Limited Company for Sale | AsiaBC HK: Register Company. Open Bank Account. Save Tax. Ready-made company, also known as “shelf company” and “shell company”, is the company registered for reselling as if an “off-the-shelf” item because the company itself does not bear any asset and history of business activities, just like an empty shell. Virtually anyone from anywhere can own a shelf company in Hong Kong. It is because Hong Kong has no restriction to nationality of a company’s director and shareholder, and corporate director and shareholders also allowed. Ready-made company is the company registered solely for reselling to the next owner, so these companies have not engaged in any business activities thus it bears no debt. In the view of Hong Kong Company Registries, shelf companies are comply to the same set of requirement as the newly-incorporated company in Hong Kong. The owners of the company can amend their company’s particular including shares transfer and allotment, change of company names and address, and appointment of new members. Should I buy a ready-made company? In short, unless the age of your company is a biggest concern to you, you should always incorporate a new one. Below is a brief comparison of ready-made company and brand-new company formation in terms of their registration lead time. Remark: “Fresh company” is the company incorporated one year ago or later. Speed. It takes as shorts as 2 working days to settle the ownership transfer. Although new company incorporation via e-registration is the fastest, it requires the presence of the company directors and shareholder in Hong Kong. Cost. aged companies are sold for high price than that of newly incorporated one. It is because you need to pay for the post-incorporation maintenance expense. The older the company, the higher the cost. Confidence. You need to ensure the shelf company you buy is 100% clean. To save your effort in the background check of your new company, you should buy it from reputable corporate service providers in Hong Kong (e.g. AsiaBC). 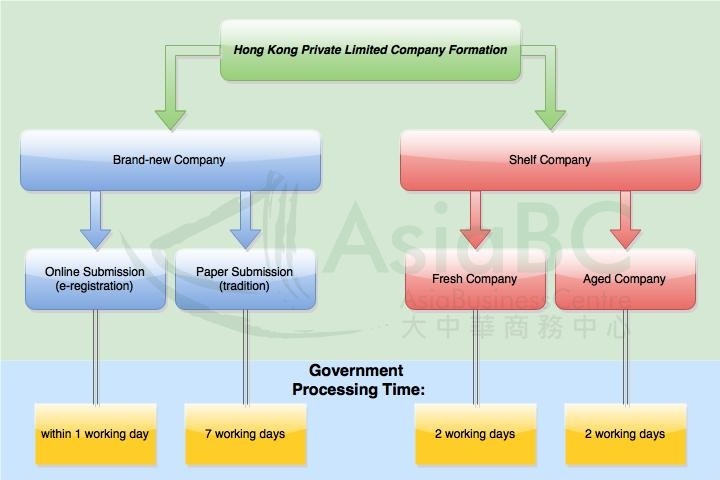 AsiaBC has a stock of Hong Kong shelf company (Hong Kong limited company without any business activities) for resale. Kindly tell your required age of company to us, we will make a quotation about the shelf company in addition to Hong Kong company secretary, registered office address and bank account opening for you. You can compare with our Hong Kong Limited Company Formation Service for our pricing and your benefits.